Vesta is proving tricky to interpret. Dawn has been there for only a few months, and the data gathered so far has already disproven a number of preconceived notions and generated dozens of new puzzles. Fortunately, scientists love puzzles! But Vesta's puzzling qualities, combined with the rigors of keeping up with a mission in the middle of orbital operations, make for slower going on the science front than we spectators might like. At the American Geophysical Union meeting in San Francisco on Monday, Vishnu Reddy summed up the challenge: "In geology, one of the simplest tools that we have at our disposal is comparison," that is, comparing something new to other things we've studied in the past. "Is there anything else we can compare Vesta to? The answer is no." There was a Dawn press briefing Monday, followed by a full day of Dawn talks on Tuesday, followed by poster sessions on Wednesday. I couldn't stay for the poster sessions but took a bunch of notes on press briefing and talks. There was not a lot of news in the press briefing; the biggest piece of news, I think, was the announcement that gravity studies have shown that Vesta is definitely differentiated, with mass concentrated toward the center, like the planets and most of the large moons. This was expected from the different compositions of Vesta's many meteorites. With differentiation, you'd expect there to be volcanism, but so far the search for definitively volcanic features has been fruitless. Upon close inspection, a promising-looking candidate for a volcano, an "unusual dark hill," shows no convincing features of a volcanic origin. The dark splat appears to be a surface deposit. It could be dark material from an impactor, or an impactor could have struck some subterranean dark deposit. There was slightly more detail in the oral sessions. Vesta has a variety of types and colors of surface features, and everywhere there is evidence of landslides and slumps ("mass movement features," in geologists' lingo). 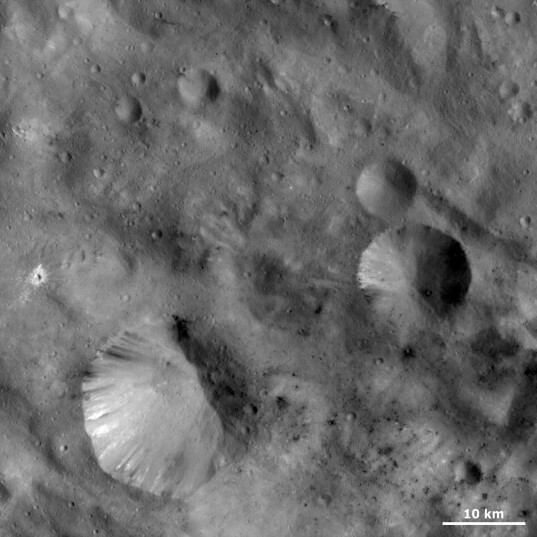 Vesta appears to be especially conducive to landslides because it has high gravity (for an asteroid), locally unusually steep slopes, and a very thick surface layer of broken-up rock ("regolith"), hundreds of meters thick. For comparison, the lunar regolith is estimated to be only a few to ten meters thick. Vesta's craters commonly have odd shapes. The large crater in the bottom left of the image has a very distinct, sharp rim on the left side, while the right side has a much more degraded rim. Dawn obtained this image with its framing camera on September 30, 2011 from a distance of 702 km at a resolution of about 63 meters per pixel. What's going on here? With the benefit of topographic information (which I don't have for this particular image), scientists can see that these craters often occur where there are steep slopes. After the crater forms, the upslope wall collapses in a landslide that fills the floor and sometimes even runs out over the downslope rim. On a crater where this has happened, none of the original rim is preserved -- it's all either collapsed or been buried in a landslide. A model impact onto Vesta from Emily Lakdawalla on Vimeo. Ejecta distribution after a modeled impact on Vesta from Emily Lakdawalla on Vimeo. In a paper published in 2011 in Geophysical Research Letters, Martin Jutzi and Eric Asphaug modeled the effects of a 50-kilometer body striking a spherical, rotating asteroid the size of Vesta at an oblique angle. This animation shows the distribution of impact ejecta following the imapct. Orange shows the pre-impact elevations; reds are higher elevation than before; yellows through purples represent lower elevation than before the impact. There is a clear low center to the impact site but because of Vesta's rotation the ejecta is asymmetric in its distribution, piling up in a steep wall on one side of the asteroid and spreading out in a gradually shallowing deposit on the opposite side. Asphaug summarized the high points: "Vesta's mega-craters grow and collapse on a time scale comparable to its 4-hour rotation, so there are Coriolis effects on the ejecta. Excavation and collapse take about an hour. The Coriolis effect generates vorticity. Is it a stormy crater? Does it generate a maelstrom of flow within the crater?" Unfortunately for Asphaug and Jutzi's model, though, the present topography of the real Vesta does not look very much like the endpoint of their simulation. Asphaug had a sense of humor about this: "There's a sweet spot to modeling asteroids where you have enough data, but not too much data." He earned a chuckle from the audience for that one. Why don't the models match reality? Asphaug suggested three reasons. He said the target structure may be different than what they modeled -- Vesta may have greater internal strength. The impact was probably a lot less energetic than the one they modeled, now that they know that Vesta's south polar basin is actually two overlapping impact basins. And finally, "we probably did not model the event to completion." Their model goes through the one-hour period of excavation and collapse, but no longer. Asphaug said that Vesta may actually "ring" for hours or even days after such a large impact, with crustal motions that can cause landslides and softening of features that do form. (He called this the "roach motel" model of Vesta's core, crediting Jeff Moore for the conceit: "energy can get in but it can't get out.") Unfortunately, identifying the possible problems doesn't make the modeling task any easier. To map out the range of possible outcomes given the range of possible basin-forming events on the range of possible physical properties for Vesta to even two hours of time after the impact woud require hundreds of simulations and a 128-processor computer running continuously for years. "3D modeling is best used as a tool to test a few key hypotheses," he concluded.